(Nanowerk News) In follow-on work to last year's groundbreaking invention of the world's first single-molecule car, chemists at Rice University have produced the first motorized version of their tiny nanocar. The research, titled "En Route to a Motorized Nanocar" is published in the April 13, 2006 issue of the journal Organic Letters. "We want to construct things from the bottom up, one molecule at a time, in much the same way that biological cells use enzymes to assemble proteins and other supermolecules," said lead researcher James M. Tour, the Chao Professor of Chemistry, professor of mechanical engineering and materials science and professor of computer science. "Everything that's produced through biology - from the tallest redwood to largest whale - is built one molecule at a time. Nanocars and other synthetic transporters may prove to be a suitable alternative for bottom-up systems where biological methods aren't practical." The motorized model of the nanocar is powered by light. Its rotating motor, a molecular framework that was developed by Ben L. Feringa at the University of Groningen in the Netherlands, was modified by Tour's group so that it would attach in-line with the nanocar's chassis. When light strikes the motor, it rotates in one direction, pushing the car along like a paddlewheel. The first nanocar research paper, published the journal Nano Letters last October, was the most-accessed article from all American Chemical Society journals in 2005. That paper was co-authored by Kevin Kelly, assistant professor of electrical and computer engineering. The nanocar consists of a rigid chassis and four alkyne axles that spin freely and swivel independently of one another. The four buckyball wheels that were used in the original version of the nanocar drained energy from the motor and were replaced with spherical molecules of carbon, hydrogen and boron called p -carborane. The nanocars, which measure just 3-by-4 nanometers, are about the same width as a strand of DNA, but much shorter than DNA. 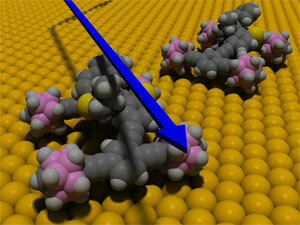 About 20,000 of these nanocars could be parked, side-by-side, across the diameter of human hair. They are the first nanoscale vehicles with an internal motor. Other members of the research team include postdoctoral associate Jean-François Morin and doctoral student Yasuhiro Shirai. The research was funded by the National Science Foundation, the Welch Foundation, Honda, the Natural Sciences and Engineering Research Council of Canada and Le Fonds Québécois de la Recherche sur la Nature et les Technologies.